When a young professional couple approached us to decorate the main floor of their brand new modern townhouse in Port Coquitlam, we were very excited. Having moved from a Gastown condo, the couple was eager to infuse this suburban location with a funky yet sophisticated downtown vibe. They were also looking for a neutral backdrop with some hits of colour and asked us to incorporate wallpaper. The statement artwork that we selected above the fireplace set the tone for this project. We started with a pair of sleek neutral leather sofas to maximize seating in the small living space and layered them with a variety of toss pillows in blues, teals & turquoise then added a few pops of orange. We defined the front entrance and dining area with a stunning marbleized grey and white wallpaper by Graham and Brown. The dark wood furniture in the dining area adds contrast and sophistication balancing the dark stained kitchen cabinets opposite. The resulting look is clean, modern and playful. Interior Design by Lori Steeves of Simply Home Decorating. Photos by Tracey Ayton Photography. Floor Plans/ Drawings by ZakCreative. 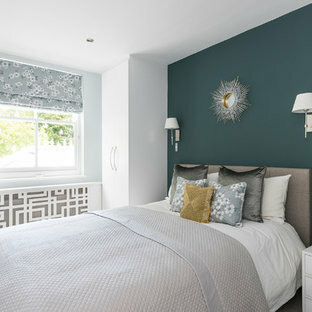 Design ideas for a medium sized world-inspired bedroom in London with blue walls, carpet and beige floors. Medium sized and white traditional two floor brick terraced house in Baltimore. Inspiration for a modern ensuite bathroom in New York with flat-panel cabinets, brown cabinets, an alcove bath, grey tiles, grey walls, a submerged sink and beige floors. 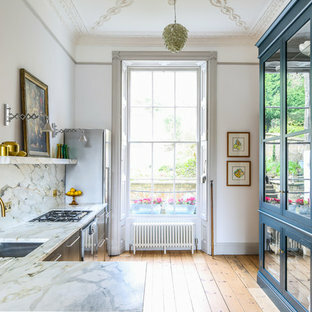 Traditional formal enclosed living room in London with light hardwood flooring, a standard fireplace, a stone fireplace surround, beige floors, blue walls and no tv. This is an example of a medium sized contemporary living room in London with white walls, a concrete fireplace surround, a wall mounted tv and beige floors. 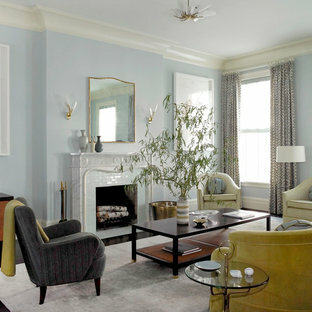 Design ideas for a traditional formal living room in New York with blue walls and a standard fireplace. Medium sized and white victorian one floor terraced house in Sydney with wood cladding and a pitched roof. Photo of a contemporary open plan living room in Other with blue walls, concrete flooring, a freestanding tv and grey floors. Inspiration for a medium sized contemporary enclosed family and games room in London with white walls, a wall mounted tv, light hardwood flooring and beige floors. Photo of a mediterranean entrance in Other with multi-coloured walls. Eclectic bathroom: we had to organise the content of this bathroom in a lovely Victorian property. In accord with the client, we wanted to preserve the character of the building but not at the expense of creativity and a good dose of quirkiness.We there fore used a mix of pebble and wood flooring to create a lavish bath area - with a twist. 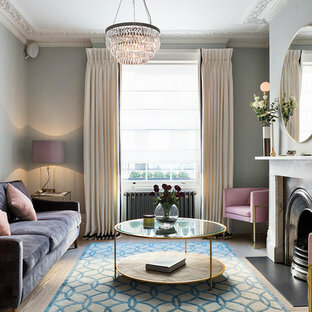 This is an example of a medium sized bohemian enclosed living room in London with grey walls. 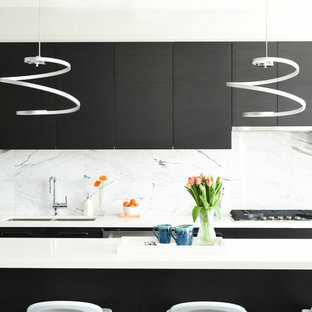 By Zoe Feldman Design, Inc. 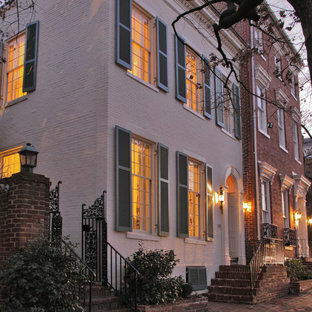 This is an example of a traditional formal living room in DC Metro. Traditional living room in Gloucestershire.